Automatic Teller Machine (ATM), which brought about a revolution in the banking sector in India, not just for the rich and the elite, but also for every poor citizen and the denizens of marginalized sector, has failed to ease the woes of people in Silchar as most of the ATMs here remain most of the time empty without money. The ATMs in Silchar, the district headquarters of Cachar, are now literally empty as more often than not, a customer has to return back empty-handed, even after traversing a long distance, to withdraw his or her money easily. Facing such hardships for the past few months, a conglomeration of six organizations on Friday met the Deputy Commissioner of Cachar to submit a memorandum with three-point charter of memorandum to improve the services of ATMs in Silchar. The six organizations – Senior Citizens Forum, Citizens Rights Protection Coordination Committee, Morning Club, All Assam Higher Secondary Teachers Association, Virtual Media Group, Opinion Movers – submitted a joint memorandum on Friday with three-point demands before Cachar Deputy Commissioner Dr S Lakhsmanan. 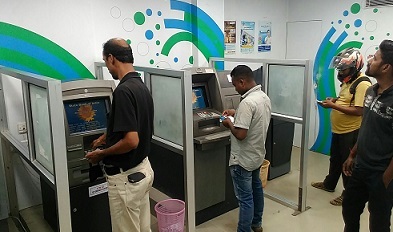 The organisations demanded that security guards be deployed in each and every ATM in Silchar and its neighbouring areas, ATMs should be kept open all throughout the night which are now closed by 10 PM in the evening and opened at 8 AM next morning and that each ATM should not remain empty.